Whoa, that’s a pretty good tongue twister. Say “Take a bookshelf selfie” ten times, fast. Here’s my bookshelf selfie. I don’t buy books often and I regularly pull items to benefit Friends of the Library book sales (the next one is May 13-15, 2015) and our local charity shop, Book Reviews Etc. The other day, Old Bones the Wonder Horse was threatening to fall on the floor. When I got a look at the title, I laughed to think that old nag has made it into my reading hall of fame. True confessions: I was tempted to edit this shelf. The Five Little Peppers? Not a book I’d recommend. Lucky Jim next to the Boxcar Children? Amis is rolling over in his grave. 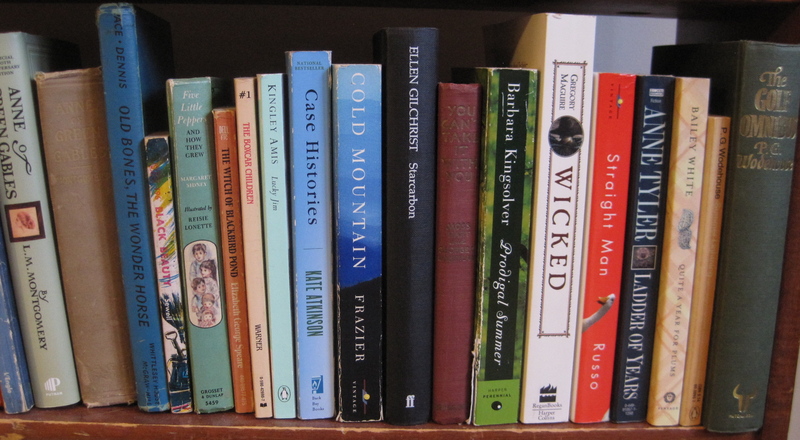 I’ve held on to quite a few books from childhood, although the biggies–Wilder’s Little House books and Tolkien’s The Lord of the Rings trilogy–have made their way onto the family shelf. My youthful obsession with horses is well represented, as is my interest in “old-fashioned” characters like Jo March and Anne Shirley. Just one work of science fiction is here, A Wrinkle in Time. Most are cheap paperbacks from the school book club and some don’t have many re-readings left in them. Lucky Jim by Kingsley Amis and Straight Man by Richard Russo reveal an outrageous side to university life that most students miss. As a faculty spouse, I find the barbs right on target. Case Histories by Kate Atkinson is a mystery that makes me wish I could write fiction. In a story full of intriguing details, humor, and pathos, Atkinson unveils one compelling character after another. Anne Tyler’s Ladder of Years is the story of a middle-aged woman who literally walks away from a humdrum existence, convinced that she won’t be missed. This “what if” story has haunted and amused me for years. P.G. Wodehouse’s The Golf Omnibus cracks me up despite my lack of knowledge about the sport. And this book won’t necessarily help: Wodehouse writes about the early 20th century game in England. His characters wield “mashies” and “niblicks” instead of drivers and putters. While this bookcase is full, I have a mental bookshelf of titles that I need to get my hands on. Some are books from childhood that I’m afraid will disappear, like Edward Eager’s stories of book-loving children and magic. I only recently discovered that they are set in Toledo, Ohio. I’d also like hardbound copies of books I’ve demolished in paperback, like Bleak House by Charles Dickens. Note to self: never try to read a 600-page novel on a smart phone. So what do these books say about me? They certainly provide a fun walk down memory lane. This snapshot suggests that humor is an important factor in my reading choices. However, the shelf below is full of bleaker books by Bronte, Dickens, Hardy, James, and Wharton. Most of all, I’m reminded that my reading (and re-reading) habit has been an education in itself.